At the appointed hour, Captain Joe Mancino walked the dozen steps from his bar stool at Tickles Dockside Pub to the ferry at D dock, ushering aboard workmen, schoolchildren, grocery-toting moms, and me. Within minutes, St. Thomas’s clamoring harbor of leviathan cruise ships receded, and we had entered the sanctuary of Water Island, the smallest of the four main US Virgin Islands. The afternoon sea twinkled like diamonds. Palm trees waved from shore. Soon friends were lifting each others’ provisions into waiting golf carts, and I was offered a ride up the steep hillside to Virgin Islands Campground. Although four miles from St. Thomas, little Water Island (2 miles long by a mile at its widest) truly is a world apart. Its community of 160 consists mainly of stateside expats all busily engaged in the tropical adventure of a lifetime. Mancino moved here three years ago from Long Island and started the ferry business. Heath Nowak arrived from Louisiana just a month ago with his family to start a new job. A long cast of characters has preceded them: Pirates once drew water from the ponds for which the island was named. Freed slaves established cotton plantations here and worked them with slaves of their own. In 1944 the US military started but never finished Fort Segarra on the island’s highest point. And a 1950s developer, Walter Phillips, began what was to be the Water Isle Hotel & Beach Club, a grand four-star resort. The hotel is gone now, and there are no nightclubs, supermarkets, or souvenir stores. A few thin roads wind past exhilarating views. Discreet, often gorgeous homes cling to the rocky, cactus-coated slopes. Deborah and Paul Quade, who balance their campground guests with their film-industry careers, offer four shake-shingled cottages next to their house overlooking Limestone Bay. They call it a campground, but trust me, it has to be cushy if I stayed there. Here in a two-room aerie (with a bed, not a sleeping bag), my roller-coaster life reduced itself to the simplest equation: walking, reading, soaking in the Quades’ solar-heated hot tub, and swimming many times a day. Charles Pemberton, a resident contractor who was born on St. Kitts, had a word for this small orbit: “You stay close.’’ Close to home. A silken crescent lapped by Druif Bay, Honeymoon Beach is Water Island’s civic and social center. Here locals gather for movie night (imagine “The Taking of Pelham 1 2 3’’ screened on a bedsheet secured to two palm trees), bingo night, and potluck cookouts, which visitors are warmly welcomed to join. Honeymoon quickly became my touchstone in all its changing hours: spreading emptily in morning quiet, ringing with children sprinting across the sand in the afternoon, suffused with the peach glow of sunset, and in the velvety night, drawing patrons to Joe’s Beach Bar as to a hearth. The campground had everything - sunscreen, bikes, snorkel gear, Internet access - but food and water required planning. Bring water bottles. The islanders collect rainwater in cisterns, so there’s no infinite supply on tap. Bring cash (no bank). Campground guests cook in an outdoor pavilion whose kitchen “windows’’ open to the sea. You can hire a private chef to cook for you, or get meals from Heidi Erwig and her Honeymoon Beach Grill at the ferry dock. But part of the fun is provisioning like a local on St. Thomas, at Crown Bay Marina’s Gourmet Deli, where mega yacht chefs do their shopping, or at the nearby Pueblo, a traditional supermarket. But the Quades had filled a notebook with day trips on the water. I chose a snorkeling adventure from Red Hook Harbor at the south end of St. Thomas, the closest point to some of the best and least visited reefs. Here you are only minutes from deserted islets like Little Hans Lollik, a Robinson Crusoe-esque vision with a reef right off the beach; or even St. John. Nauti Nymph captain Herbert Seiler, an artist-adventurer’s son who easily free-dives 100 feet, is a wonderful teacher. His local knowledge took us to cliff faces where giant tarpon and spotted rays lurked, while boobies dove with us into blinding clouds of silversides. “There when you want it,’’ is the Water Islander’s view of St. Thomas’s urban grit and splendor. After snorkeling, I found Charlotte Amalie and Frenchtown worthwhile. A decade of waterfront restoration has made St. Thomas’s historic free port wonderful again, evoking the heady mix of Danish, Spanish, French, German, English, and Italian traders of old. I casually counted over 100 jewelry stores on sidewalks so thronged that people walked in the streets. If you know what to look for (I didn’t), amazing deals can be found on single stones from $142 to $42,000. The Colonial hipped roofs and wrought iron verandahs become outright majestic as you head east to Kongens Gade, the heart of the historic district. The wedding cake-white Government House holds oils of French Impressionist Camille Pissarro, a native son. For a true StairMaster experience, climb the “99 steps,’’ or any of the stepped streets, to more exemplary facades and house museums. On the way down, find 5040 Norre Gade ste-2, which houses Zora of St. Thomas (who is originally from Missouri). The shop of enterprising women crafts leather sandals fitted to your feet, and also makes glass jewelry and canvas packs and bags. When in St. Thomas, Water Islanders do lunch. (The last ferry leaves Crown Bay at 6 p.m.) If the line outside Gladys’s Café in Royal Dane Mall looks daunting, walk a block to Cuzzin’s on Back Street for honest Caribbean fare. West on Veterans Drive, I took a table facing the aqua sea at Michael and Judy Watson’s Petite Pump Room. My stewed chicken with fungi, a polenta-like side made with cornmeal and okra, arrived with their signature hot sauce packed with red and green Scotch Bonnet peppers. The Watsons also make their own tropical ice cream; try the soursop. A left onto Rue de St. Barthélemy, and you’re in Frenchtown, settled in the 1800s by immigrants from St. Barts. From its toenail of a harbor, small fishing boats still ply the local waters, selling their catch at Quetel Fish Market. A homespun Eiffel Tower made of Styrofoam marks the French Heritage Museum, where docent Pierre “Pete’’ Ledee lovingly led us among old photos of the settlement’s first families, their handmade fish nets, and French lace. Inside a chocolate-colored Creole house, you’ll find Craig and Sally Darash, who came here by way of Connecticut, serving artful tapas with a Manhattan-grade wine cellar to match. But the true ambassadors of this special neighborhood can usually be found on the porch of La Petite Fenêtre (The Little Window), a bar whose legendary window dispensed rum to its fisherman patrons of old. When I reached Crown Bay Marina, Mancino was at Tickles finishing a plate of buffalo wings. The bartender, Lindy Ebol, asked if I wanted a diet soda - already she knew my drink. Nowak was there, too, ordering an after-work piña colada for the commute home to Water Island. A loose line began forming, everyone talking about water filtration systems and composters. Looking around at their sun-bronzed faces, I realized that after only a few days I knew them all, and they, me. Patricia Borns can be reached at patriciaborns@comcast.net. Take the Water Island ferry ($5 each way) from Crown Bay Marina, about five minutes from the airport. Walk, bike, or golf cart on-island. On St. Thomas, taxis cost $4 anywhere in town, or find a bus stop to catch the “dollar safari’’ used by locals ($2; ask “Safari?’’ to make sure). 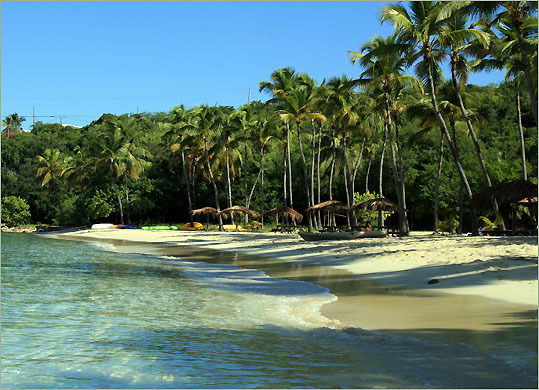 Honeymoon, Limestone, and Sprat Bay are the Water Island beaches. Activities include Saturday night dinner, Sunday night potluck, and Wednesday night bingo, all on Honeymoon Beach. The campground rents mountain bikes for $10 a day or $20 a stay and snorkel gear for $5 a day or $15 a stay. Reliable powerboats for rent, or captained excursions. Half day with captain $375. Captain Joe Mancino offers excursions to nearby Saba bird sanctuary and Flat Key. Trips start at $200 for two hours.